I like sleeping because it feels good and recharges me for the day I have ahead. I value sleep a lot, that’s why I get the best sleeping implements that money could buy. Apart from plush duvets and orthopedic mattresses, I found out that firm bed frames are important for a comfortable and healthy sleep. This is why I bought my very own metal bed for my bedroom. You might reason out that having firm bed frames would mean having hard mattresses to lie on. Actually, it doesn’t work that way. You know that you will get comfortable sleep if you buy high quality mattresses in the first place, regardless of where you place them on. The purpose, thus, for having firm bed frames is for mattress support, to keep it still or protect it from deteriorating. Have you ever had that experience where you’re using a table to either write or eat, and it keeps moving awkwardly because one of its legs are unbalanced? That kind of experience is what awaits your mattress with inferior quality bed frames. Believe me, I know of this annoyance first hand. The slightest movement will cause any mattress, even those made out of memory foam, to shift and wake a light to moderate sleeper. This was actually one of my major motivations to get rid of my old bed frame and purchase a metal bed. It would also be worth mentioning that good bed frames such as metal beds help in maintaining the quality of the mattress by preserving its material. My old bed frame, made out of untreated wood, caused a gradual degradation of my expensive orthopedic mattress, tainting it with unexplainable amber-colored stains and scratches at the bottom. I was glad that I changed bed frames soon afterwards. But that’s not all metal beds are for. Apart from being useful, a rare trait to be found this days, they also look good in almost any setting or room motif. My bedroom is composed of wooden floor panels and dark blue wallpapered walls with embossed patterns. Apart from my desk cabinets, my double sized metal bed takes up the visible space, and I don’t know if its just me, but I think the whole set up looks good enough to be featured in an interior design magazine (presumably one where I am the editor-in-chief!). 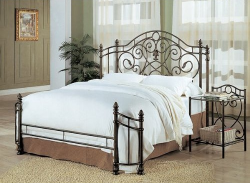 If you really want to try out metal bedframes, I suggest you look up the same product I bought from Amazon – the Queen Size Antique Bronze Finish Metal Headboard & Footboard. It is big enough to accommodate a double orthopedic bed and I really liked the design in its headboard, as well as its dark metallic finish. It is also reasonably priced, despite being the handsome piece of furniture that it is.